There are many methods using which one can incite anger among Indians; and Snapchat management just discovered one of them: Call India as poor. After a report emerged that Snapchat CEO Evan Spiegel has called India as a poor country, intense anger erupted all over India. As per the report, way back in 2015, Snapchat’s CEO and other leaders were having an internal meeting regarding Snapchat’s growth, globally. One of the employees named Anthony Pompliano was explaining some reason about Snapchat’s slow growth in India. The report was published based on Anthony Pompliano’s statements, and details filed by him in a case in court. It must be noted that Snapchat later issued a statement, saying that Evan has never said these lines, and Anthony Pompliano is fabricating these claims, as he was terminated from the company due to bad performance. But, the damage had been done. Anonymous Indian hackers have claimed responsibility for hacking and leaking around 1.7 million users’ data of Snapchat app. As per the claim, the hackers had discovered a vulnerability in the Snapchat app, last year in December. Now, after their CEO Evan issued anti-India statements, and his ‘arrogance’, the hackers were angry, and in retaliation, they leaked 1.7 million users’ data. However, Snapchat has vehemently denied any such leak of users’ data. 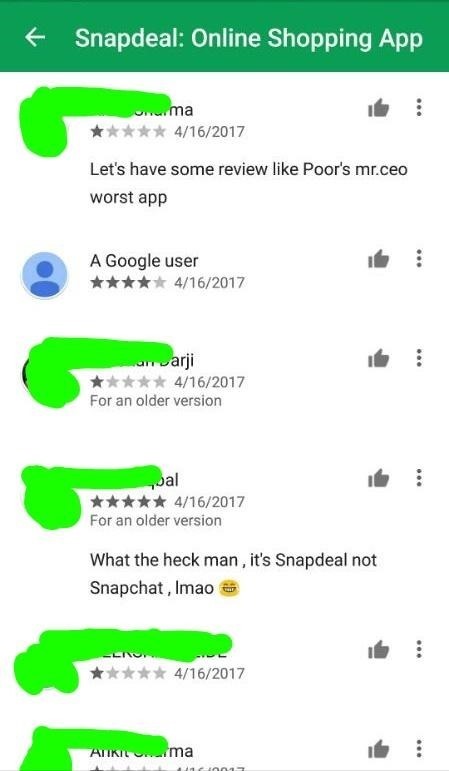 Despite Snapchat issuing statements, denying any such statement describing India as a poor country, various users from all over India started uninstalling the app and gave massive 1 star ratings to the app. Hashtags such as #BoycottSnapchat were trending since the beginning of the weekend. In reply, several users also said that uninstalling Snapchat is not the solution because India’s poverty cannot be removed this way. Boycotting Snapdeal instead of Snapchat is the equivalent of slapping Arbaaz Khan because you’re angry with Roger Federer. Meanwhile, due to the confusion, hundreds of users started uninstalling Snapdeal app, thinking that the CEO of Snapdeal had made these statements about India being poor. If you are a Snapchat user in India, then we would love to have your opinion on this issue: Did you uninstall the app in retaliation? Do you think that uninstalling Snapchat app will solve the problem of poverty in India? "Angry On Snapchat CEO’s ‘Poor India’ Remark, Hackers Leak 1.7 Million Users’ Data; #BoycottSnapchat Trends", 5 out of 5 based on 12 ratings. Gionee Becomes Yet Another Company To Caution Consumers Against Buying Online!